Animal cruelty at its worst! 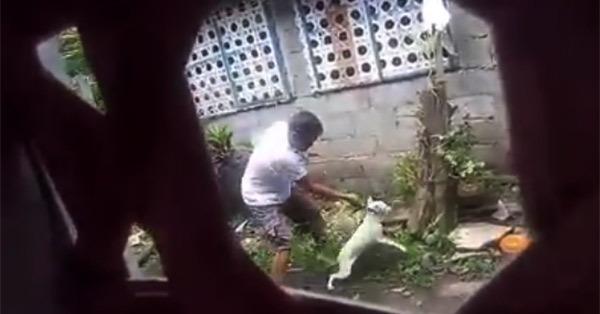 This describes the act of a man who slammed a dog in a wall and hit the animal's head with a bottle in this video. According to the uploader, Dandy Boon Solidarios Ayson, the suspect is their neighbor who is a known drunkard. The complainant hails from Pigcawayan, Cotabato but lives in Davao City. ~Mans Bestfriend VS Dog worst Enemy~RATED SPG ~lang awang pinaghmpas ng lasinggerong kapitbahay ang aso namin. The 50-second clip has been viewed over 14,000 times on Facebook since it was posted on Saturday, January 2, and was most probably brought to the attention of the Philippine Animal Lovers Society (PALS). Section 6 of Republic Act 8485, also known as the "Animal Welfare Act of 1998" as amended by RA 10631, states that "it is unlawful for any person to torture any animal, to neglect to provide adequate care, subject any dog or horse to dogfights or horsefights, kill or cause or procure to be tortured or deprived of adequate care, sustenance or shelter, or maltreat or use the same in research or experiments not expressly authorized by the Committee on Animal Welfare." 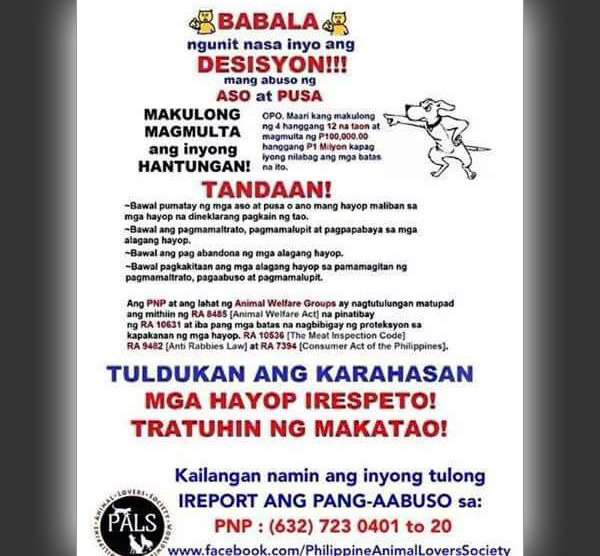 If found guilty, violators could be slapped with a fine ranging from P100,000 up to P1 million and jail time of 4 up to 12 years.